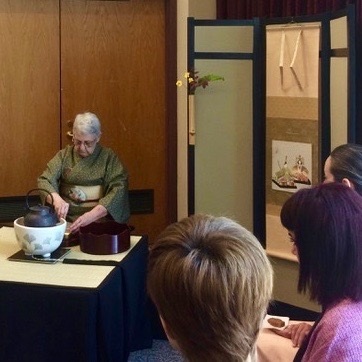 An illustrated talk: either an overview or with a focus on Japanese culture, hospitality, the many traditional crafts related to Japanese tea ceremony, tea gardens or architecture. a) our trained assistant in the main guest role, dressed in kimono, plus one guest from the audience. b) two guests from the audience. c) up to thirty guests served matcha tea and a Japanese confection (requires 2 or more trained assistants). The fee varies according to number of guests, number of assistants, distance, etc. We bring all the tea furniture and utensils and can adapt to many locations. Please schedule at least one month in advance. LESSONS are given in the ryurei style, seated on a stool at a low table, rather than in the traditional seiza style, upright kneeling position on tatami floor. A Taste of Tea is a one-time introduction to Chado and the guest role while partaking of tea and sweets during an authentic tea ceremony. Fee varies based on location, number of guests, etc. Please schedule one month in advance. Beginner Introduction Series is a 4-10 weeks series of group lessons where students begin learning the bonryaku temae, tray procedure, which can be used in any season to host friends and family. Authentic utensils are provided; matcha and Japanese confections are included. Contact Linda for more information about the next scheduled series. There is much more to learn about Chado, The Way of Tea. You will learn how to host tea gatherings that vary with the season and interests of your guests. Please contact Linda for more information.